I did not manage to get my tapas recipe in on time for the food24 competition so decided it would be perfect for this month’s vinatics. I just love nibbling while drinking and even more so when it is with friends. We have done a fair bit of entertaining this past month and the one thing I know about myself is that I need to eat when I drink. Tapas make the perfect sense to start an evening off with – a small bite or two to whet the appetite, as well as to make sure the wine does not go down on an empty stomach. We were tasked to choose something from the KWV Classic Collection and this was my choice as it goes down perfectly at the start of a warm evening. 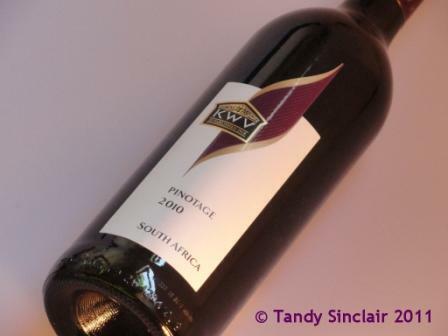 Chill the pinotage before serving and enjoy! This tapas was inspired by my gezpacho however, some people like my husband do not like raw onions, and so I needed to cook the ingredients before serving them. I grew up eating raw onions, but since I have stopped eating them raw to suit Dave’s palate, I have found them quite offensive in some dishes. The raw onion flavour overpowers everything else. These little tapas are a perfect way to start the evening – a little slurp of something before tucking into the wine, and the conversation. Edit September 21st: I have withdrawn my entry from the Vinatics competition as it does not quite comply with food24’s rules of blogging about the actual evening and publishing photographs of my guests. Those look completely yummy. What an unusual, but fun way to nosh. Fantastic, Tandy! We’ve been making a cold Jamie Oliver version, which includes stale bread! I am going to have to read my recipe books and give his one a go! The new theme is looking good! This looks delicious, Tandy!! I haven’t had time to go online the last couple of weeks and I have missed your blog!! I love the newe look!! Your tapas looks and sound scrumptious! I could eat a whole bag of nik naks while drinking with ease! Making me think of a Bloody Mary, as it is 7 a.m. here anyway. Looks delicious …I’m sharing them with Twitter and Facebook. thanks for the share! I think there is nothing wrong with making it into a bloody mary, just not something I could do at 7am! 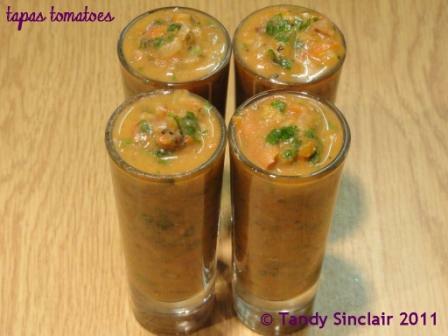 These look gorgeous…and I don´t add raw onion to my blended gazpacho. Like you, I need to eat when I drink…so much more sensible! Adore South African wines, but we can´t get them in Spain. Will have to wait till I am next in London for a slurp! I have to eat otherwise I do the all fall down number! Love this – like gazpacho shots. Could you add vodka for a Bloody Mary version? !